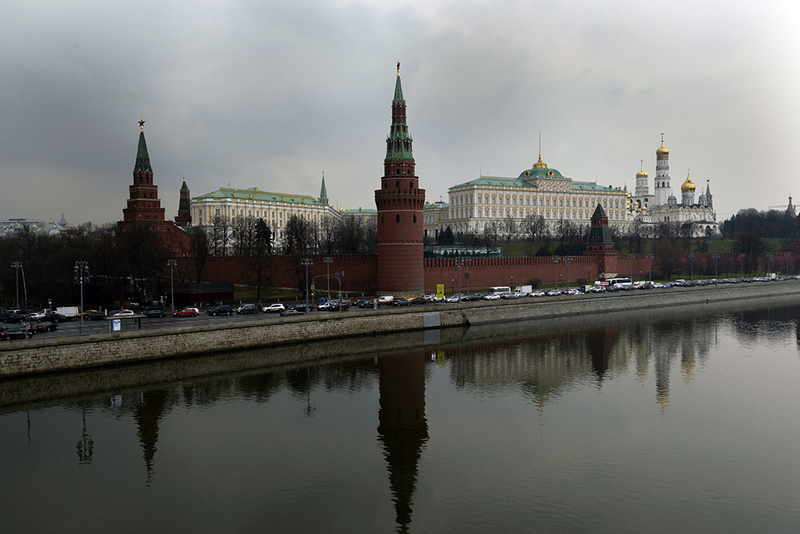 The Kremlin is seen behind the Moskva River in Moscow, April 7, 2017. Russia is treating the online environment like a new theater for conflict and has invested in developing its capabilities just as it would in developing a new weapon system. The situation in Ukraine also led to a clear break in relations with the West. The United States and the European Union put in place sanctions against Russia and evicted Russia from the G-8. Additionally, the United States froze lower-level diplomatic contact and greatly expanded U.S. security assistance and military deployments to Europe.7 This new geopolitical environment has led many analysts to note that the United States and Russia have entered a new Cold War.8 However, while the events in Kyiv led to a freeze in relations, the approaches of the United States and Europe were also designed to facilitate an eventual thaw. For instance, sanctions were designed to be temporary and would end if there was progress in the Minsk negotiations over eastern Ukraine.9 However, Moscow saw relations with the West after Ukraine not as frozen but as broken. For the Kremlin, if the allure of Western liberal democracy as embodied by the European Union was such that Russia could “lose” Ukraine—a place so valued by Putin and Russian nationalists that they sometimes refer to it as Novorossiya, or “New Russia,” a reference to the czarist Russian empire—it meant that liberal democracy itself posed an acute geopolitical threat to the Kremlin.10 A threat that, in Putin’s mind, had to be matched. Soviet intelligence sought to amplify failings within the United States, such as in the area of civil rights, and pushed fake stories and conspiracy theories to discredit the West, including the claim that the CIA was responsible for inventing AIDs.18 According to Rid, by the 1960s, “disinformation—or active measures—were well-resourced and nearly on par with [intelligence] collection in the KGB … The Cold War saw more than 10,000 individual Soviet bloc disinformation operations.”19 While Soviet dezinformatsiya efforts were vast, the relative concentration of the news media and the slower pace of the news cycle limited its effectiveness. The information and communication revolution of the past two decades, however, has transformed the information domain and created new access points for the Kremlin to conduct disinformation operations. U.S. Cyber Command and the intelligence agencies need to assess their cyber tools in light of the Russian cyber operations. What seems evident from the Obama administration’s policy response is that U.S. cyber tools, while likely the most powerful in the world, are not nearly as nimble, creative, or flexible as believed. In light of the 2016 attack, the United States needs to assess whether it is prioritizing the right operational objectives and is appropriately postured to counter disinformation campaigns in the cyber realm. Actions should include going after Russian hackers or exposing Russian censorship tools, as suggested by retired Admiral James Stavridis, former NATO supreme allied commander.96 There may not be as much to be done in this space as it seems, as countering Russian actions in cyberspace with cyber tools may not be effective. The possible costs of the development of international cyber norms and the potential escalatory nature of an overt cyber response may outweigh the potential gains of such a response. But given the threat posed by Russian information operations, it is necessary to assess whether U.S. cyber resources are being deployed effectively and whether the United States is making the investments needed to develop the right capabilities in light of Russian efforts. For instance, Hans-Georg Maassen, the head of Germany’s domestic security agency, expressed the need for Germany to develop offensive cyber capabilities: “We believe it is necessary that we are in a position to be able to wipe out these servers if the providers and the owners of the servers are not ready to ensure that they are not used to carry out attacks.”97 The United States should similarly explore using its cyber tools to destroy stolen information before it can be deployed for disinformation campaigns. Troll the trolls. Just as the United States monitors social media for counterterrorism purposes, it could develop its ability to detect state-sponsored operators. The United States could alert American users who interact with these operatives, or their controlled bots, that the accounts they are interacting with are either suspected agents of a foreign government or are bots controlled by suspected agents. A U.S. government account, operated by US-CERT, could effectively troll the trolls by pointing them out and shining a spotlight on their efforts. This sort of interaction would be similar to Google’s warning to Gmail users that a state-sponsored entity is seeking to hack someone’s email.106 Establishing this capacity would require additional resources and manpower but could likely rely on the same type of automation used by Kremlin-controlled bots. Combating disinformation is also about standing up in support of freedom and democracy around the world at the highest levels of the U.S. government. Unfortunately, the Trump administration has not only failed to speak up for democracy and human rights, but it has also actively sought to undermine these values and what America stands for by, for instance, hosting Russian Foreign Minister Sergey Lavrov at the White House days after Russian interference in the French election—as well as ignoring human rights abuses and inviting President of the Philippines Rodrigo Duterte to the White House.129 The Trump administration has bent over backward to accommodate and offer support to authoritarian governments and strongman rulers. Moreover, Trump’s attack on the press, Secretary of State Tillerson’s unwillingness to allow the press to travel with him, the abandonment of the State Department’s daily press briefing, and rhetoric about locking up political opponents cause tremendous damage to the moral authority of the United States and serve to weaken America’s ability to lead.130 When the leader of the free world no longer values democracy, these principles are weakened worldwide.